The word “Sabbath” comes from a Hebrew verb meaning “to cease, to come to an end, to stop, to rest.” Sabbath keepers are not so because they have studied the subject thoroughly, but because they have not studied the subject enough. To us Christians Jesus is our sabbath & our Rest. The early church called the day Jesus rose from the dead, ‘the Lord’s Day’ Rev. 1:10 or “Dies Domini” in Latin (where the word ‘Domingo’ Sunday in Spanish comes from) and we celebrate His resurrection every Sunday and was also the day the Christian church was born. Pentecost falls on a Sunday. The earliest Christians never considered Sunday to be a rest day or the Sabbath. The first mention of Sunday being a day of rest was in 220 AD by Origen. The first record of any kind of Sabbath observance is found in Exodus 16. The Sabbath was a sign between God and the nation of Israel Exodus 31:13-17. There is no record that Abraham, Isaac, Jacob, or Joseph observed the Sabbath. Job lived in the patriarchal period, and although we read of him offering sacrifices, etc., there is no mention of any Sabbath observance. It is worthy of note that whenever the ten commandments are repeated in the New Testament (e.g. Matt. 19:18-19; Romans 13:9, etc. ), the Sabbath commandment is never included in the list. In the book of Acts the Sabbath is set forth not as the “Christian day of worship;” rather, it was used as a day of evangelism (see Acts 13:14-16; 13:42; 16:13; 17:2; 18:4). For Paul and the other Christian evangelists, the Sabbath day was indeed a work day, as they labored for souls! & early church writings confirm this. The first (G3391 μία= mia) day of the week (G4521= σάββατον= sabbaton, plural). HRM say G3391=mia, is not first but one and G4521 is sabbath, translating according to them: “One of the Sabbaths” meaning ‘One of the Saturdays’. Hebrew weekdays names didn’t exist, so they were determined in a referenced order from one weekly Sabbath to the next weekly Sabbath (the interval between 2 Sabbaths). 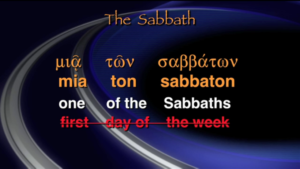 G4521 sabbaton is translated sabbath or ‘week’. In the 8 passages were we find ‘the first day of the week’ is designated by the numeral “one” and the genitive of sabbaton, mostly in the plural. The fact that the numeral is feminine indicates that the feminine noun “day” is understood, sabbaton is a masculine or neuter noun, translating ‘day one of the week‘. So connecting mia (feminine numeral) with masc. or neuter noun sabbaton is wrong grammar. Still not convinced, even Greek scholars overwhelmingly agree? After Jesus resurrection we read in Mat.28:1 “In the end of the sabbath, as it began to dawn toward the first day of the week, came Mary Magdalene and the other Mary to see the sepulcher.” Greek- Opse de sabbatōn , tē epiphōskousē eis mian sabbatōn, . . .- If we translate these 2 words as ‘sabbath’ it would be a contradiction. ‘In the end of the sabbath at the beginning of the sabbath’ ? And . . . . . . . .having been past . . . . . . the . . . . . . . .sabbath, . . . . . . . . . .Mary Magdalene . . . .
kai (#2532) diagenomenou (1230) tou (3588) sabbatou (#4521), Maria hē Magdalēnē . . . .
And . . . . . . . .very . . . . . . . . . early . . . . . . . the. . . . . . . . first (day ) . . of the . . . . . . . week . . . . . . . . . . . . they come . . .
After spending many years examining ancient Jewish writings, Hebrew Scholar John Lightfoot wrote a Commentary on the New Testament in which he explains the Hebrew method of counting the days of the week. He noted: “The Jews reckon the days of the week thus; One day (or the first day) of the sabbath: two (or the second day) of the sabbath;” etc. (1859, 2:375, emp. in orig.). Also I know Jewish people and they assure that they use the word yom (dia) plus a letter representing numbers from 1-6, because sabbath the seventh day is the only one with a name. So Yom Reeshone is first day ( equivalent to Sunday), Yom Shaynee is second day (Monday), etc. It is very strange that the Hebrew Roots Movement (experts or with Hebraic mind set) don’t know this. Also found in Jewish Calendar : “The days of the week are simply known as first day, second day, third day, etc. Sometimes they are referred to more fully as First Day of the Sabbath, etc. Below is a list for those who are interested“. It is well known that the Pharisees fasted on Mondays and Thursdays or twice a week. “The Pharisee stood and prayed thus with himself, ‘God, I thank You that I am not like other men—extortioners, unjust, adulterers, or even as this tax collector. I fast twice a week; (#4521 sabbaton) I give tithes of all that I possess” Luke 18:12. The Didache, a manual of church instruction from near the end of the first century were the word sabbatōn is understood as week & also confirms Luke 18:12 : “And let your fasts not stand with the hypocrites, for they fast on the second day of the week and on the fifth (deutera sabbatōn kai pemptē “the second [of the] week and the fifth;” i.e. Monday and Thursday), but you shall fast on the fourth and on the Preparation (i.e. Wednesday and Friday)”. 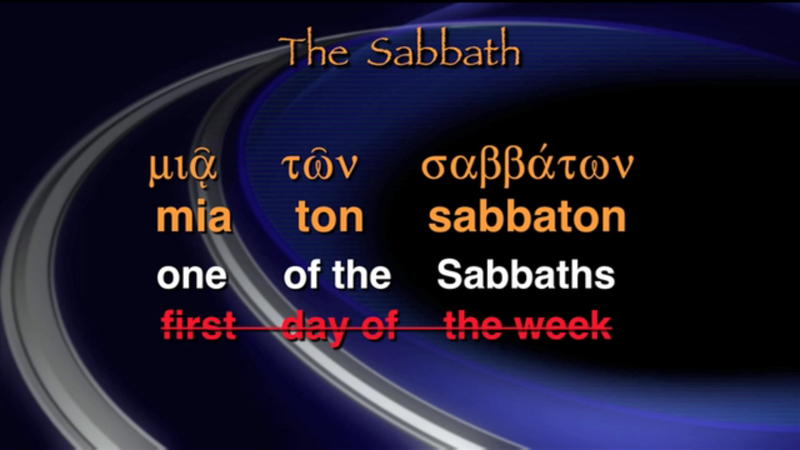 The HRM also mentions there is a word for week in Greek that was not used instead of sabbath. But the regular Greek word for “week”- hebdomas, which had been used in the Septuagint, (not a reliable translation by the way) is not found anywhere in the New Testament. However they don’t mention that the Greek titles of a few of the Psalms in the Septuagint, e.g. Psalm 24 (Psalm 23 in Septuagint) is designated tēs mias sabbatōn, “for the first day of the week.” Psalm 48 (Psalm 47, Septuagint) has in its title deutera sabbatou, “for the second day of the week.” Psalm 94 (Psalm 93, Septuagint) is designated as tetradi sabbaton, “for the fourth day of the week” (Wednesday), etc. Early Christians always gathered together on Sunday, the first of the week. The only time Sabbath keeping was mentioned regarding Christians was by a cult-sect known as the Ebionites . The Ebionites were gnostics Jew believers in Jesus as Messiah, it was a cult of Judaizers who enforced circumcision, rejected Apostle Paul’s teachings, denied Jesus’ virgin birth and his deity. The earliest reference to a group that might fit the description of the later Ebionites appears in Justin Martyr’s Dialogue with Trypho (c. 140). -155 AD Justin Martyr “[W]e too would observe the fleshly circumcision, and the Sabbaths, and in short all the feasts, if we did not know for what reason they were enjoined [on] you–namely, on account of your transgressions and the hardness of your heart. . . . [H]ow is it, Trypho, that we would not observe those rites which do not harm us–I speak of fleshly circumcision and Sabbaths and feasts? . . . God enjoined you [Jews] to keep the Sabbath, and impose on you other precepts for a sign, as I have already said, on account of your unrighteousness and that of your fathers” (Dialogue with Trypho the Jew 18, 21).